Preheat the oven to 100'C. Using an electric mixer, beat half of the caster sugar with the egg whites. Once the mixture has doubled in size, add the remaining sugar and continue to whisk at a high speed until the mixture is thick and forms stiff peaks. Transfer the mixture to a piping bag and the pipe the mixture on to a lined baking sheet. 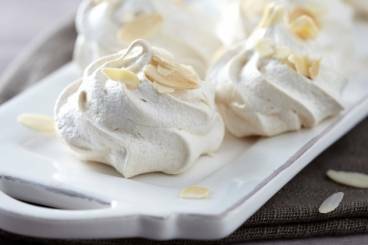 Sprinkle the almonds over the meringues, transfer to the oven and bake for 1 hour at 100'C. Remove from the oven and allow to cool before serving. Store in an airtight container if not using immediately.